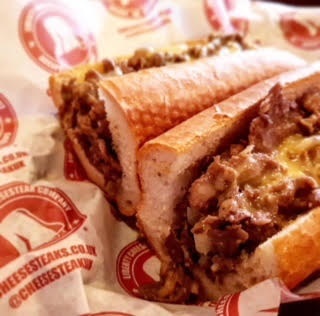 I had already experienced the delight of an authentic Philly cheesesteak courtesy of the Liberty Cheesesteak kiosk at the annual Democrats Abroad July 4th picnics in Portman Square, London. Run by expatriate Philadelphians the steaks were the real thing - yearly heaven for those of us homesick for down-home food. Having had great success over the years with their kiosks in other parts of London Liberty Cheesesteak decided to open a restaurant. I was one fan who had encouraged them to do this - to be based either in the West End or in St John�s Wood near the American School. It was a special moment to attend their Grand Opening on 5 April at 80 Cleveland Street, Fitzrovia W1. (The nearest tube is Warren Street.) I have to confess I had already sampled their food before the premises had been 100% completed and was impressed. On 5th April I was given a terrific spot downstairs in what they call the �Penalty Box� -- a quiet alcove that seats two. In fact, I am thinking of asking them to make this my weekly permanent spot! The steaks are exactly the same as those you would experience in Philadelphia. On opening night coleslaw came with the meal but when I went back with a friend a couple of days later the side was a gherkin - pickle to Fluffyans. The rolls are the real Amoroso deal - but try explaining to a non-Philadelphian why a cheesesteak HAS to be in an Amoroso roll..
Buffalo wings, eggplant parmesan and, of course, hoagies, root beer and cream soda are also on the menu. They�ve promised me corn on the cob later in the year. The bar offers great beer and spirits. On the Sunday I returned with a British friend - she liked the steak , or maybe she was just being polite ! - the big screen was showing the previous night�s Phillies game . They won 20-1! I was jumping out of my skin. Our meal - two big steaks, a Pepsi and a root beer - totalled �30 including service, which was outstanding. Indeed the service at Passyunk Avenue is American-style gracious, friendly and efficient. I give the place 5 stars. When she isn't undergoing chemotherapy for Stage 4 cancer at the Royal Marsden Carol Gould is a BBC and LBC broadcaster. The author of 'Spitfire Girls' and 'Don't tread on me -- anti-Americanism Abroad' she hails from Philadelphia and was Drama Commissioning Editor at ITV for PBS for eleven years.